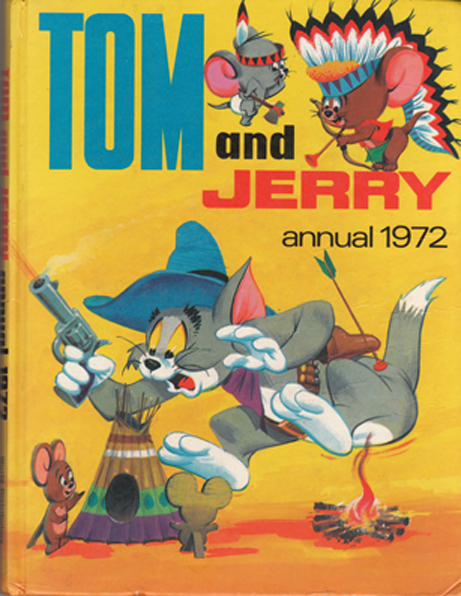 Description: Join everyone's favourite cat and mouse duo in this very rare annual featuring 12 stories in comic strip format (all in colour). The front and rear cover are in good condition with very bright colours. The lower-right corner has a small 0.6″ (1½ cm) crease, whilst the upper-left corner on the rear board has a small chip. There is also some slight creasing to the rear cover and two ballpoint pen marks. The spine is bumped. Pages generally clean and bright – except for rep, which has a 2.8″ (7 cm) tear lengthways and a 2½″ (5 cm) tear along the spine and some sporadic marks and foxing along the edges and page bottoms. Some pages have small dog ears where they meet the binding; page 67 has a 0.8″ × 0.6″ (2 cm × 1½ cm) tear where this has happened. Previous owner has customised the book with a sticker on the fep as well as their name and address. Not price-clipped – bears original price tag of 13/- and 'revised' decimalised price of 65p above it. Measures 12″ × 9.2″ (30 cm × 23 cm). Large 4to. 77 pp.